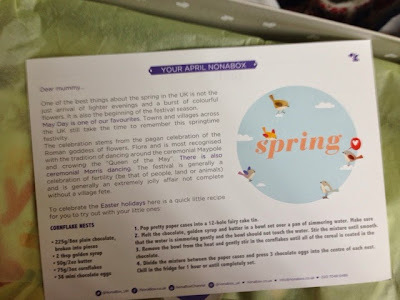 I have been absolutely loving my Nonaboxes lately and Aprils one has been my favourite so far. If you haven't heard of Nonabox you can read my blog post introducing them and you can also read my December, January, February and March posts too. 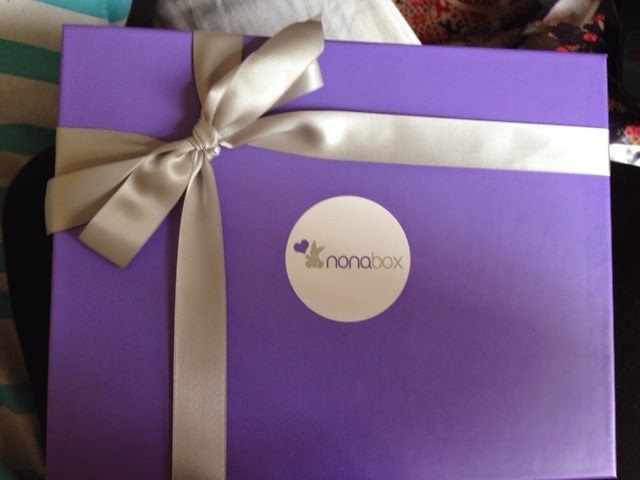 The Nonabox arrived in it's usual sturdy purple box with all the items wrapped in gorgeous green tissue paper. 1) Snooze Baby Sweet Dreaming taggy (RRP £12.95) - I've seen these around online before but have never owned one. The concept is great. It's a little comfort blanket with tags around the side as babies are known to enjoy the feeling of the tags. C at almost 20 months old will not go to sleep with holding my hand and playing with my fingernails so this is proving to be a great substitute! 2) Plum Little Yums in pumpkin & banana (RRP £2.49) - We are huge fans of Plum baby good here but I've never seen these before. C was very excited when I showed him the box and shouted "ta-ta! Ta-ta!" He gobbled them all up so I think they were a hit with him! 3) Plum Mighty 4 pouch (RRP £1.19) - C has tried these before and had it finished in about a minute! Pouches are so handy, especially at his age as I can pop them in the changing bag when were out and he can happily eat them by himself as a snack. 4) Organic Babies Body Wash & Shampoo (RRP £7.25) - The lavender scent is absolutely gorgeous and as we know lavender is a soothing and calming fragrance so it's perfect for settling babies down to sleep. It's 83% organic too! 5) Arbonne Rejuvenating Cream 62ml (RRP £29) - This being in the box really surprised me! It's a lovely little treat for mum, smells so fresh and is just what I need with being 22 weeks pregnant and chasing around after a toddler! 6) The Soother Company 'I Love Mummy' soother (RRP £5) - I'm currently trying to wean C off his dummy so I will be keeping this for the new baby. I'd never heard of The Soother Company before so it was great to be introduced to a new brand. 7) Mega Bloks First Builders Block Buddy (RRP £2.99) - We bought C a big bag of Mega Bloks for his first birthday and he absolutely loves them so this was a lovely treat for him. He's been carrying it around everywhere so I think he likes it! Overall, this box comes in at around £60 which is amazing considering that the box is only £25 to buy. We will use everything included so it is definitely well worth the price. 2 comments on "Nonabox: April"
Wow! That does sound like a great box! !